Can you believe that today this beautiful painting hangs in a modern supermarket in Lancashire? Well, that is indeed the case and its present location is due to an emotional roller-coaster of changing attitude, fashion and fortune. It was painted in 1876 when Ansdell was at the height of his prowess in depicting sheep, but also when he was no longer medically allowed to visit his beloved Scotland. It was during his summers in Scotland when he developed a great affinity with the Highland shepherd, his sheep, his landscapes and his dogs. This never left him and it must have been a bitter blow to know that his fragile health would no longer allow him to be part of this unique natural environment. This picture is an embodiment of his feelings at that time. Richard Ansdell kept live animals to paint, and to me, the ewe and the two lambs are so beautifully depicted that they can only have been life studies. The dog is not a problem – this particular dog is the star of many of his paintings and was a family pet. The girl could have been a hired model or one of his granddaughters: her red hair being an artistic stroke of genius, acting as an accent colour to draw the eye into the painting. At this date red hair was becoming fashionable; previously being regarded with superstition until the pre-Raphaelite effect when it became a thing of beauty and admiration. The contemporary critics and buyers were looking for ‘comfortable’ depictions of everyday working life without dirt; those featuring animals and children being the most commercial. By this time Ansdell had acquired an astute business awareness and obviously bore this in mind – the bare feet of the 'lassie' being a reminder to the viewer of the girl’s poverty. Ansdell has used a favourite ploy: setting the central figure silhouetted against the background – a background which is remarkably devoid of his beloved Scottish scenery. The girl is purposely not engaging the viewer but looks down demurely as if she is shying away from eye contact; this in itself appealed to the viewing public, instantly creating a feeling of voyeurism. The animals are in brilliant stance: the weaker of the two lambs receiving personal attention from the 'lassie' but displaying reluctance at being carried away from its mother. The mother herself keeping near enough to the 'lassie' so that she can gently nudge her elbow, reminding her of her maternal instincts. The stronger of the two lambs naturally stays with the family group; the sheepdog – never off duty – looks up to the 'lassie' for instructions. All this combines to make a pleasing, sensitive composition and enables Ansdell to demonstrate his illustrative prowess in depicting contrasts between the adult and the lambs’ fleeces, giving him the paramount opportunity of depicting his beloved tri-coloured collie in prime position in classic pose. This painting has impact and appeal – it is life-sized, presented in a massive gilt frame, a foot deep. A piece of Victorian decorative ‘furniture’ on a grand scale. As to its history, we don’t know if it was painted for a specific exhibition, although it was a favourite subject. The word 'herd' relates to sheep or cattle. Perhaps, instead, it was a commissioned painting and its disappearance from the public domain would probably indicate this. It next emerges as the founding work of the wonderful Victorian Art Collection donated by town citizens to the borough of Lytham St Annes, Lancashire. 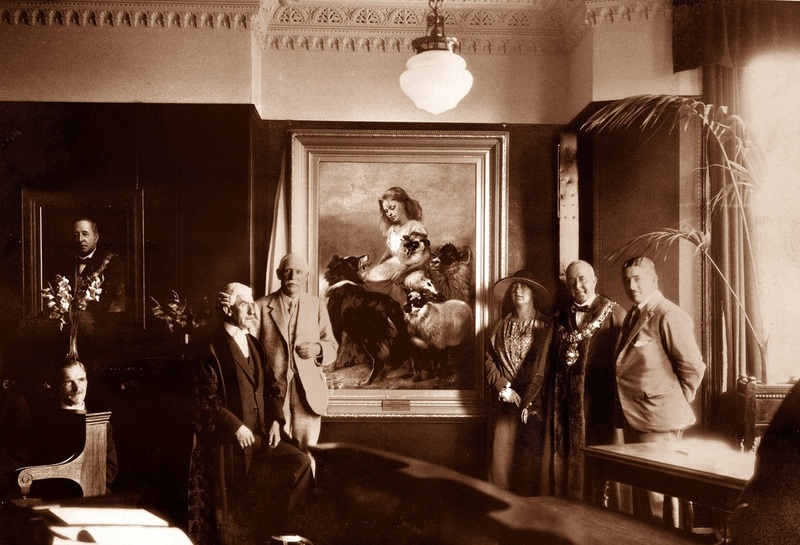 In the 1920s it was fashionable to engage in the philanthropic donation of artefacts, thus enabling the townspeople to enjoy these works of art rather than for them to be hidden away in private collections. The Council at the time accepted these gifts with great publicity in the spirit of generosity that was intended. 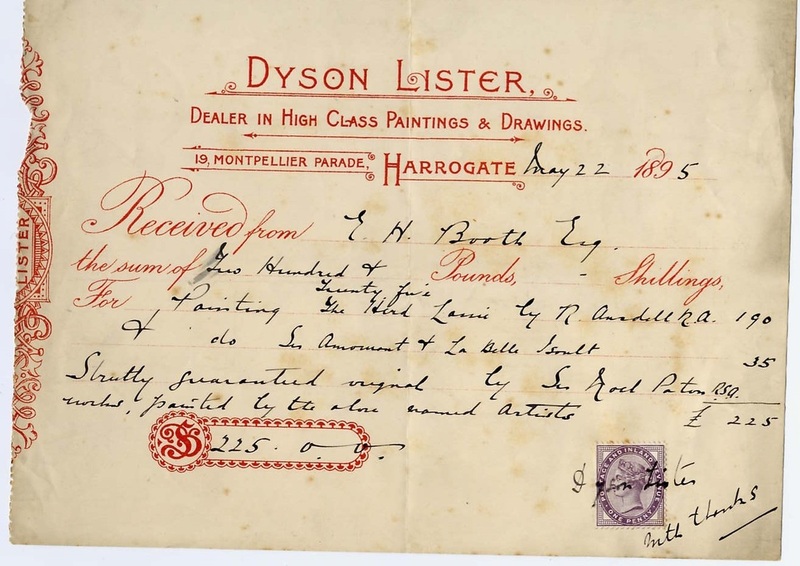 The painting originally came into the Booth family when it was bought by Edwin Booth in May 1895 from Dyson Lister, Art Dealer in Harrogate. Sir Joseph Noel Paton RSA (1821-1901), who guaranteed that this was an original Ansdell painting, was himself a well-known Scottish artist of the times and would probably have known Richard Ansdell as they moved in the same art circles from time to time. La Belle Iseult by William Morris ?? is also mentioned on this Receipt as a minor painting to the The Herd Lassie and only costing £25. If this is the original William Morris painting, I find this remarkable. The painting is now at the Tate Britain in London. 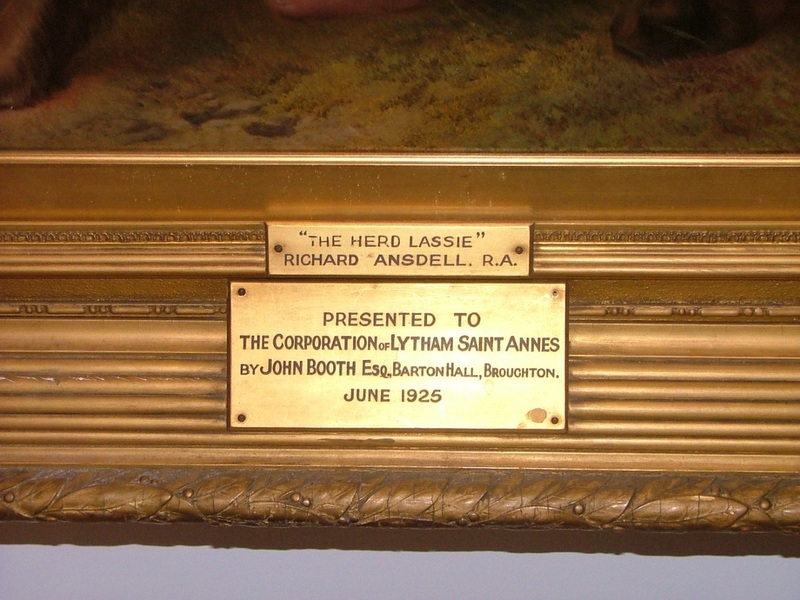 “The Herd Lassie” was presented to the Corporation of Lytham St. Annes in 1925 by John Booth, the son of the founder of today’s northern supermarket chain of Booth’s. Regrettably, as time went on, attitudes changed and everything Victorian became spurned as symbolic of a confident bygone era that would never return. The paintings were neglectfully hidden away for over eighty years, neither liked nor respected. For a little while our poor 'lassie' was in an attic gallery at Lytham Hall and for the last seven years was face to the wall in a cupboard. Now she has returned to her former glory – initially gracing the reception rooms at St Annes Town Hall – and after careful conservation and having had her face cleaned for the first time is triumphantly on display at the splendid Fylde Gallery at Booths Store, Haven Road, Lytham. She, her dog and sheep are the only permanent item at that gallery due to their links with the Booth family. Why not visit her when you pop in for a sandwich and reflect on her triumph of beauty over adversity? You won’t regret it; she is known to bring tears to the eyes . . .
​To view the complete artworks of Richard Ansdell in the Collection click on his name under Artists on the Home Page.